Do you want to start a movement in your Network Marketing Business? This week on the Authentic Influencer podcast, we’re talking about finding your movement. A movement is all about believing passionately in something and then sharing it with others. This concept transcends the idea of just selling a product. You have a purpose that is unique. When it is paired with the product your hold, or the service you offer, you have the capacity to make an incredible impact on this world. 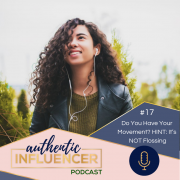 Listen in to learn more about understanding your movement, understanding people, and offering a solution. Testing the market isn’t a new concept, but it may be new for you. Companies have been utilizing this technique for decades. To begin a movement that impacts the lives of those around you, it is crucial to understand what speaks to them. You hold the solution to problems that face your market every day. While we use mindset often to discuss the finances of your business, or your confidence in sales, it can also be used when discussing your movement. Adjusting your perspective around your product, and your purpose, and the importance of building equity in yourself can be the spark to ignite your movement. Our challenge for you this week is to come up with an idea, and answer the question, “What is the one problem that you solve?” Then, use the tips discussed in this episode to go out and start testing it! If you are interested in learning more about creating a movement, finding your niche, and nailing down your messaging, then you won’t want to miss our first ever Authentic Influencer Workshop in Farmington, Utah. This three day event, January 22-24, 2019, will be an amazing opportunity for you to jump start your business in 2019, learn more about how to find success without being scammy, and find support from a room full of individuals who are on the same journey as you! For more information, and to register, visit socialtenacity.com/workshop. Use the Authentic Influencer Podcast [DISCOUNT CODE – AIP] for an exclusive rate.